[These primeval solitudes] suspend your forced sense of your own importance not merely as individuals, but even as men. They allow you, in one happy moment, at once to play and to worship, to take yourselves simply, humbly, for what you are, and to salute the wild, indifferent, non-censorious infinity of nature. These mountains have been here for a long time. They will be here, real and powerful and eternal, when we are all forgotten. They put us in our place. But sometimes they give us something, too; strength, I guess you would call it. Other people, like you, will come here for sanctuary. Other people who are running away from something. Of course, Deborah is running away from something; she is taking control of her life into her own hands, and escaping from under the thumb of a domineering mother and a manipulative lover. Before she can begin a new life she must find solitude and peace in which to be able to come to terms with her past, to find the strength to forge her own identity, and to break free from these negative forces in her life. This is a coming-of-age story without any startling departures from the expected. The really fun part of One Happy Moment for me is in the setting. There are beautiful descriptions of a landscape Louise Riley knew intimately, and clearly loved. She uses this mountain landscape to explore the theme of nature as a source of healing. 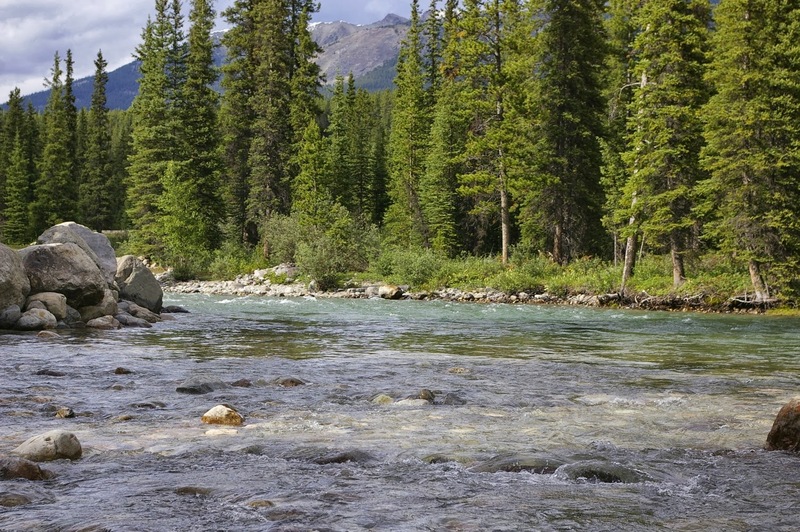 Deborah, surrounded by the grandeur of the Rockies, is cradled and rejuvenated, gaining perspective on her own troubles, and tentatively re-envisioning her life with only her own happiness in mind. Just ahead, with the sun shining on it, stood the green shoulder of a mountain. To her surprise it looked friendly and protective. Deborah gazed at it for a long time before she turned to look acros the valley at a towering peak, dazzling in its snowy majesty. Suddenly she was conscious of a feeling of safety. Deborah slipped away from the Lodge and found a sunny spot on the lakeshore. She sat, with an open book on her knees, gazing toward the glacier at the head of the lake. she was not consciously thinking of anything. The warmth of the sunshine, the serenity of the lake, and the strength of the mountains combined to soothe her mind, and, for the first time in weeks, her body felt relaxed. To be happy you must be reasonable, or you must be tamed. You must have taken the measure of your powers, tasted the fruits of your passion, and learned your place in the world and what things in it can really serve you. To be happy you must be wise. This happiness is sometimes found instinctively, and then the rudest fanatic can hardly fail to see how lovely it is; but sometimes it comes of having learned by experience, and involves some chastening and some renunciation; but it is not less sweet for having this touch of holiness about it, and the spirit of it is healthy and beneficent. Soon after this quote, Deborah "felt that here was a moment, isolated and complete, when she wanted to look neither forward nor back." From this moment, Deborah feels the comfort of friendship, of confidence in herself, and happiness in the present moment. 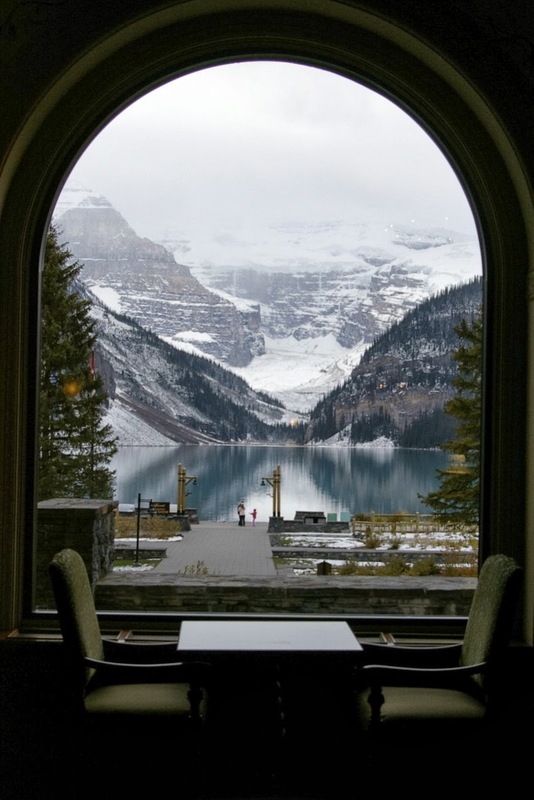 The view from inside Chateau Lake Louise. Deborah looked. 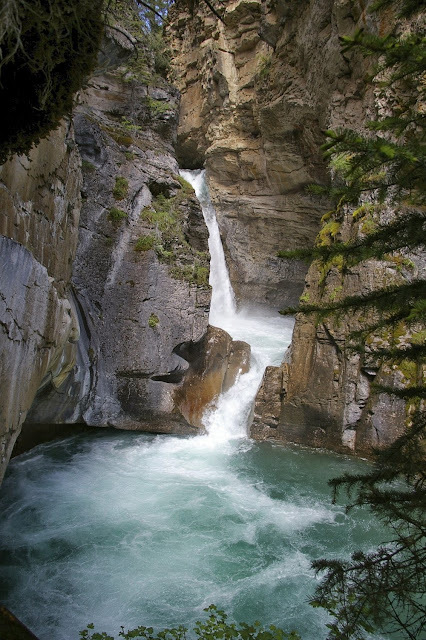 "Lake Louise," she whispered. There it was, the shining blue lake, reflecting trees and mountains and the glacier at its head, its beauty waiting to bring infinite solace to the minds of men. "It is even better than the picture post cards, isn't it?" asked Andrew. "It lifts my heart up every time I see it. But it will look better still after a beer and some lunch. Come on." They ate their lunch in front of a huge window overlooking the Lake. "The C.P.R. should photograph you looking out with that rapt expression on your face, my dear. 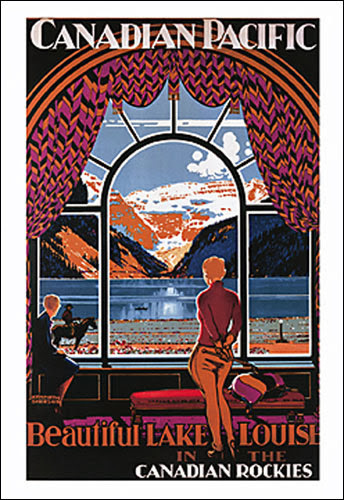 They could make it into a poster and call it, 'Lucky Lady looks at Lovely Lake Louise'. This novel has some interesting things to say about women finding their own way in the world and having the strength to determine their own destiny. Each of the female characters reflects a different choice available to women: there is the feisty sexually liberated lodge owner who is unconcerned about social mores and always has the upper hand because of her confidence and beauty, there is the innocent young girl who shamelessly throws herself at the man she loves, there is the elitist snob who is so concerned with superficial that she never sees what is below the surface, and there is the busy-body who maintains power over her husband by brow-beating him. Deborah finds not only a path for herself to travel, but influences the women around her through her graceful insistence on seeking her own way. She is a strong women insistent on charting her own path, but feminine and respectable enough to do it without making anyone else feel threatened. I enjoyed this novel. It was delightfully escapist, but also contained some real wisdom about life and happiness. It was fun to scamper through the same places I know so well. As the Wise Man of the Bush said, "These mountains have been here for a long time. They will be here, real and powerful and eternal, when we are all forgotten. They put us in our place." 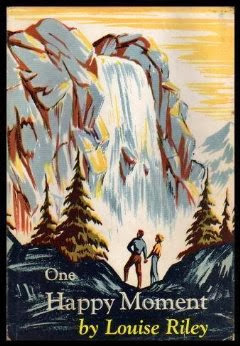 It's funny to think how little has changed in those mountains since 1951! Louise Riley was the granddaughter of Thomas E. Riley, an early Alberta pioneer rancher who worked the land along the Bow River. The Riley family prospered as a result of the development of their ranch into the Calgary communities of Hillhurst, West Hillhurst, and Hounsfield Heights. Her father, Ezra Hounsfield Riley donated Riley Park to the city in 1910. Louise Riley became a children's librarian, storyteller and author. She worked for the Calgary Public Library from 1930 until the time of her death in 1957. A branch of the Calgary Public Library was named after Louise Riley. Oh my. I would absolutely love to read this. On a whim this morning, I pulled off The Book of Eve from the bookshelf and read a few sentences and was reminded of Ethel Wilson's Swamp Angel (another Canadian woman shedding her past in a lake-filled landscape), so it feels like kismet to discover your review of this novel just now. Unfortunately the only copy available locally is Reference Only, but I will have to take an afternoon sometime and explore in the reference library: it sounds like unmissable classic Canlit. I hope that you are able to get your hands on that copy. It's quite a lovely work in many ways. Wouldn't it be amazing if we had a Canadian equivalent to Persephone or Virago to keep all these gems alive? Maybe we do and I don't know about it. Funny that you should mention Swamp Angel and The Book of Eve because I've just been going through my NCLs and those are two that I have but haven't read yet. Just finished the Friskney book about the Ross-McClelland years at M+S and it's got me all stirred up to tackle some more of my unread NCLs. Sounds wonderful and I have never heard of the author or the book - off to put it on the wishlist. There are so many good, lost novels out there......! I had a quick look to see if there are any available for sale out there... a few showed up for a reasonable price so you never know! I love the sound of this! And thanks for the brief bio of Riley. 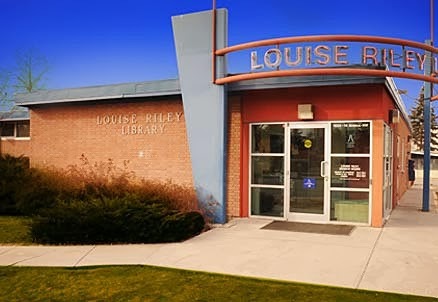 I remember the Louise Riley library branch from when I was living in Calgary but never thought to research who it was named after. Yes, I can see you enjoying this one, Claire. This is her only adult novel, which is a shame. She wrote a few childrens' chapter books also set in the Calgary area. I'm going to try to get my hands on them. Are they your photos in this post? They're stunning. The one taken from inside the chateau was breath-taking. I would like to read more Canadian writers as I only know your big ones (Atwood, Munro, Tyler). Thanks for this wonderful review. I am not familiar with the author or title either but I am always interested in reading about women's personal journeys. The photos are also breathtaking! I enjoy learning more about Canadian literature through your blog. I've just read this; I tracked it down after reading this post. In some ways I found it an appealing read - I too am familiar with the setting, having for several years lived and worked on a horse ranch in the Rocky Mountain foothills of Alberta, just northwest of Calgary. I spent as much time as possible sightseeing, hiking and riding in the more accessible parts of the mountains themselves; there is something about being ion the midst of such natural spendour which puts the smaller human woes into perspective, as the heroine of One Happy Moment discovers. What I couldn't quite get past was the clunkiness of the writing style; it felt very forced and I was never able to lose myself in the narrative as fully as I would have liked to. (Was the writer once warned against using contractions? Her dialogue feels terribly stilted much of the time!) I've read her juvenile stories, and stylistically they're much the same, but what might get a pass in a book aimed at a grade school reader is not what I was hoping for in a "grownup" novel! And heroine Deborah didn't engage me as fully as she should have, either. I kept thinking that some of her issues were of her own making, overbearing mother or not! An interesting vintage read. I'm going to link your review to mine, if that's all right. I enjoyed your analysis thoroughly.